Greg and Kurt speak and present at hospice and home care associations, health service organizations and community groups. Both gentlemen are members of the National Speaker Association. 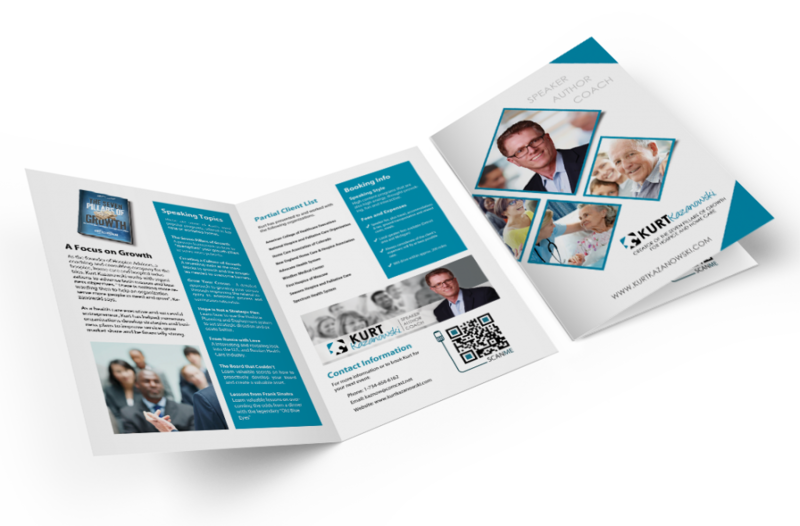 As founder of Hospice Advisors, a coaching and consulting company for the hospice and home care industries, Kurt Kazanowski is a visionary whose inspiration is contagious. The author of the “Seven Pillars of Growth,” Kurt presents and speaks on service delivery improvement, growing the business, and strengthening financial performance. As both dynamic speakers, Kurt and Greg’s programs show organizations how to strengthen and build the essentials to serve more people. Kurt utilizes the principles and strategies in the “Seven Pillars of Growth” to get audiences actively thinking about their organization’s ability to grow. Through speeches, webinars, workshops and training programs, Greg and Kurt create and implement services that provide exceptional care and compassion to the people the organizations serve. Simultaneously, by implementing strategies that provide dramatic growth in organizations, the benefits to hospice and home care services are further recognized by the community at large. As an accomplished entrepreneur with a personal care home health company, Homewatch CareGivers in Plymouth Michigan, and First Home Care in Moscow, Russia, Kurt offers a unique hands-on and practical views of how to be successful. Clients find that these life and business lessons are invaluable. Kurt and Greg are also successful leaders with an executive leadership post with The National Hospice and Palliative Care Association, Hospice of Michigan, Leader Dogs for the Blind, VITAS-Orlando, Hospice Care of the West, and Oncology Home Care Specialist. A short list of organizations that Kurt and Greg has presented to and coached include, Hospice of New Mexico, Heartland Hospice and Home Care, Seasons Hospice and Palliative Care, Advocate Health System Hospice and Home Care, Signature Hospice and Home Care and Hospice of Michigan. Lastly, international consulting experience includes Zimbabwe Africa, Managua Nicaragua, Lagos Nigeria and Moscow, Russia and Bangkok Thailand. Kurt and Greg’s competencies extend across a broad spectrum of leadership, including creating and executing mission critical objectives, strategic planning, marketing, sales, referral development, business development tactics, mergers and acquisitions, physician relations, service delivery, and forming strategic partnerships between hospices and hospitals. For more information, please call (734) 658-6162, or submit your inquiry using the form at the bottom of this page. Kurt Kazanowski is an accomplished speaker, presenter and coach. He has a passion for sharing solutions and ideas on a number of challenges facing health care organizations. His presentation style includes humorous stories, difficult experiences, and life changing events that will make his presentation to your company or organization heartfelt and memorable. Everyone desires growth, but not all organization do what is needed to service more people in order to grow. 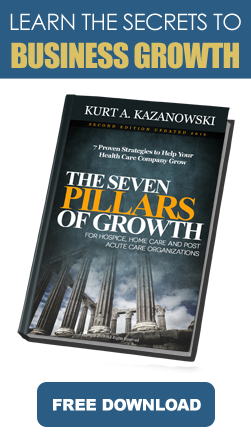 This presentation provides a proven framework on how to “strengthen” your growth pillars to serve more patients. Practical solutions to real life challenges will get the audience actively thinking about their organization’s ability to grow. Every organization has a silent “Invisible Velvet Glove on the Spigot of Growth” in play in their organization that affects their ability to grow. This presentation reveals the signs and symptoms of the invisible glove, what the roadblocks are, and more importantly how to blow through these barriers. This thought-provoking and engaging presentation will challenge traditional thinking and open new doors for accelerating the growth of your business. As competition in hospice and home care continues to grow so does the quest for finding a As competition in hospice and home care continues to grow so does the quest for finding a competitive edge. This presentation discusses the fundamental edge of service excellence as a “front and center” strategy to support growth. Without excellent service you run the risk of losing your reputation and referrals…the lifeblood for any business! Attendees will take away from this presentation practical hands-on strategies from world-class health care organizations you can install now. Grow Your Census with The Business You Have! Why invest one more dollar to make the phone ring if you cannot convert the referrals received to an admission? Attendees will learn a detailed approach on how to improve the rolling 90-day conversion rate. One of the approaches to increase conversion rates is to create a stronger culture of growth. This presentation will challenge traditional thinking of “We’ve always done it this way,” and will open new doors for accelerating the growth of your business. This no-nonsense presentation challenges you to think about how you are setting the strategic direction for your organization. Some organizations consider strategic planning merely the development of a list of strategies, followed by a list of actions steps; however, nothing gets done! Learn the ten key mistakes most organizations make, and the value of the unique planning process called “Hoshine Planning.” Attendees will walk away from this presentation “turbo-charged “and ready to chart a clear strategic direction. In 2008, Kurt fell in love with a beautiful woman in Russia. While the relationship didn’t work out, it led him to opening a Home Care company in Moscow. Who would have thought an International love and the aging Russian population would be birth to a business opportunity. It’s an interesting story, to say the least! This presentation draws comparison and contrasts in the U.S. and Russian Health Care Industry, especially in the areas of Home Care and Hospice. In Russia, physicians are paid for their referrals. In the United States, it’s illegal, with prison terms guaranteed. In Russia, it’s a way of doing business…and it actually works. Gain some insights and appreciation for the Russian approach to hospice and home care and learn a few valuable lessons along the way. Kurt’s father, his pitching coach and best friend, had a stroke in November, 1995, which changed his family’s life. The stress and new demands placed on his mother, brother and himself were crushing as they tried to navigate a fragmented health system. While he and his brother worked in the health care industry they were not personally prepared for this. This made Kurt realize what an enormous challenge navigating the health care system must be like for other people. This heartfelt presentation shares the tears and joy of dealing with his father’s stroke, his recovery, and subsequent death that followed six months later, along with ten valuable lessons everyone should know about navigating the health care system. Does your organization have a board development plan in place? What do your Strategic Planning Advances look like? In Kurt’s thirty years of executive management, he’s experienced a number of dysfunctional Boards. These Boards were not born this way; executive management just let them happen! This presentation details how to develop and manage a high performing Board in the Not For Profit Sector. Learn some valuable secrets on how to proactively develop your Board and create a valuable asset. Has your hospice or acute care organization stopped growing? What are the roadblocks? The roadblocks are often so soft and silent – “The Invisible Velvet Glove” – that you don’t even know you’ve driven past the roadblocks, down a long, lonely road with pot holes and danger. This presentation challenges traditional thinking and opens new doors for accelerating the growth of your business, helping you get back on the super highway to drive the success of your business. Imagine having dinner with the legendary Frank Sinatra. It was one of the biggest thrills of Kurt’s life when he did just that in the summer of 1976 and the famed Excalibur Restaurant in Southfield, Michigan. Kurt was in nursing school and just starting his career. During dinner, Good “Old Blue Eyes” shared many stories that Kurt remembers to this day, influencing many facets of his life and career. Thank you for considering Kurt or Greg for your upcoming event! The more information you can share with us about your event, the better. Once we receive your information, we’ll get in touch with you very quickly. If the phone is more your thing, you can contact us at (734) 658-6162.